Beaches, skylines, food, culture and art, especially street art – there are so many things to explore in a new city. I fell in love with street art after visiting Dubai and it made me wonder where else in the world I can admire beautiful murals. Chiang Mai is a place we have fallen in love with since our first visit in 2016. In 2017 we decided to stay there for almost six weeks. We mostly stayed in the Old City and spend numerous hours just walking around enjoying the sites and culture. This is when we noticed a number of different street art drawings. 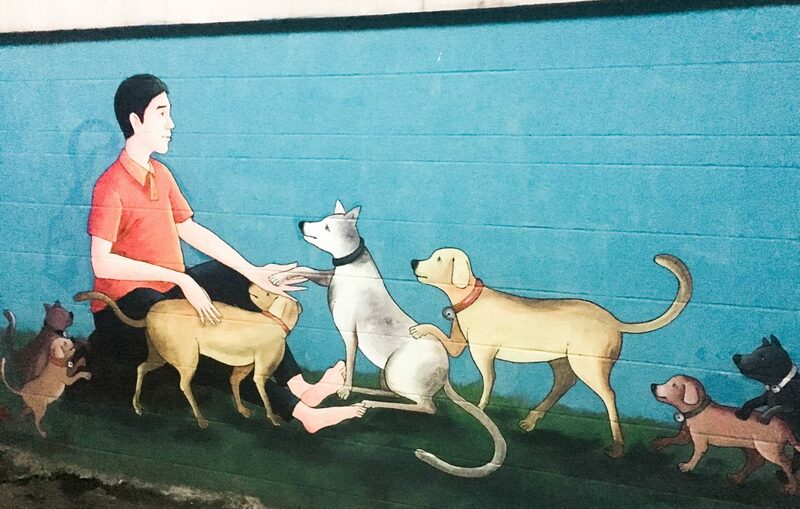 One particular favourite was the dogs painting near a shelter. You can find it too if you simply get lost in the north of the Old City of Chiang Mai. Cape Town, the incredible Mother City of South Africa, is one of the best cities in the world for street art. The murals can be found just about anywhere. One of the most beautiful pieces is on Shortmarket Street, in the CBD district (a perfect starting point to appreciate street art in the city). This is not far from Bo-Kaap, one of the most charming neighborhoods of Cape Town. It’s by Falko Starr, who many consider to be Cape Town’s Banksy. Starr believes street art is a form of self-expression, but also a social and political statement, especially in the time of apartheid. Another part of Cape Town to find impressive pieces of street art is Woodstock. 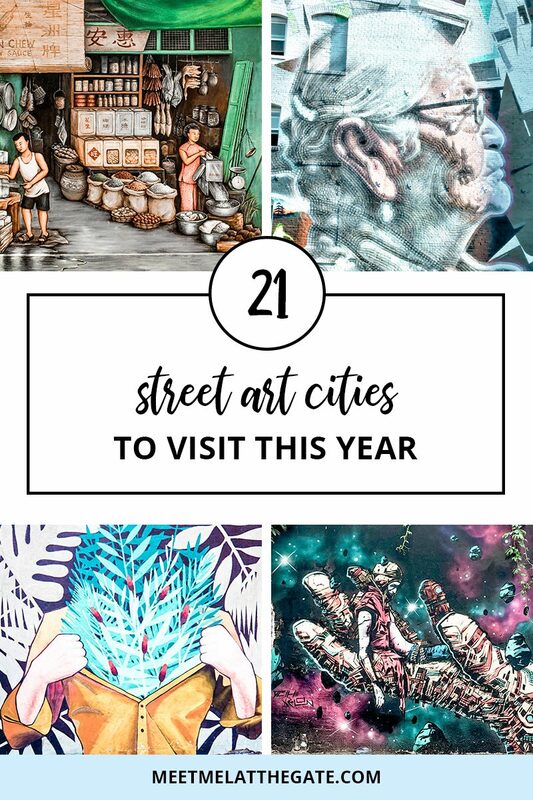 This is a neighborhood where the narrow alleys hide beautiful works of art portraying superheroes, beautiful wildlife, and even political statements. A particularly popular one is that of the Rothschild giraffe, representing a type of giraffe that is most endangered. It’s a reminder of how fragile the beautiful wildlife of Africa is. District Six is another part of town where there are lots of beautiful murals. The most famous one represents Nelson Mandela, the late former South Africa president. It can be seen on the corner of Canterbury and Constitution Street. Visiting Reykjavik in Iceland I didn’t have too many expectations about what I would see and do, as a lot of photos of Iceland are stunning landscapes and waterfalls. But Reykjavik was beautiful and finding the colorful street art scattered around the city was a real treat. Iceland, in general, is known as being an expensive place to travel to. If you’re looking for some free things to things to do in Reykjavik, then spotting the city’s awesome street art is the perfect activity. Most of the street art I saw was brightly coloured and firewalls or large warehouse buildings. There was a mix of differently sized murals but most of the art was quite easy to spot if you just wandered around the city. If you have some free time on your Iceland trip then Reykjavik is definitely worth a visit to enjoy the art around the city and of course, take lots of pretty photos! From the Space Invader to the monsieur BMX, Montpellier has it all and more. Famed for being one of the most popular student towns in France, this incredible city is home to a plethora of amazing street art. Montpellier is understated beauty in all forms. It’s not as well-known as its south coast acquaintances Nice, Marseilles and Perpignan because it’s really not a large tourist destination – which makes exploring easy. And if you’re into street art, you have a lot of exploring to do. Space Invaders: You can explore the city based on the world-famous Space Invaders work. And if you mark it on a map, it will form a giant space invader! Monsieur BMX: Mr BMX’s work is all around the city. You can’t miss these half bikes stuck on walls throughout the town. He started in Montpellier but has since added his signature BMX to cities like Paris, Brussels and New York. 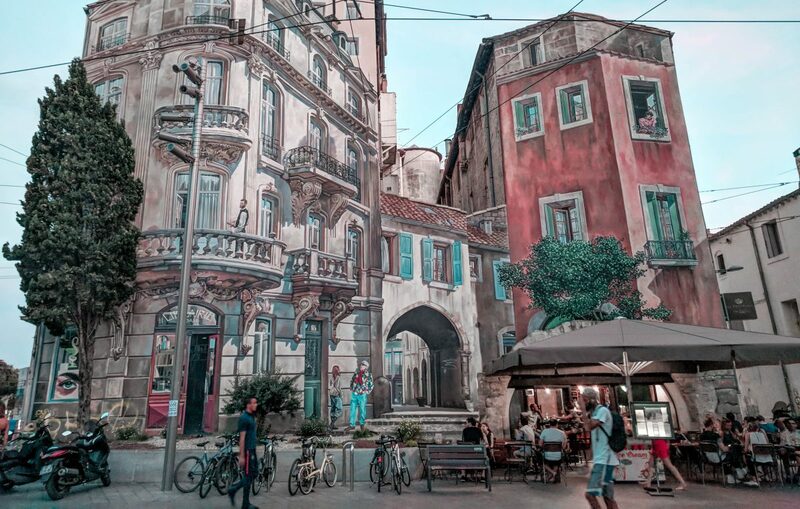 Trompe-l’oeil: This is an art technique to create optical illusions and is what creates my favorite mural in Montpellier. There are quite a few paintings in this style throughout the city, and the whole of France in fact, but my favorite is the one at La Place Edouard Adam (pictured). The Cradle: Located in the Verdanson area of Montpellier. The “cradle” of graffiti and street art is where professional and amateur street artists come together and add artwork and tags. It’s almost like an open-air museum of street art through the ages. Colourful Facades: To add some flavor to some of the city’s gloomier neighborhoods giant vivid drawings have been painted on the side of buildings – they’re impossible to miss and make the dullest of buildings look beautiful. Old City Streets: You’ll see so many small (and large) murals throughout the old streets of the city center that you’ll find it hard to believe that it’s still illegal in France! Austin is one of the USA’s coolest and hippest cities. Not only is it popular for music events and food, but it is also renowned for its street art. In fact, Austin’s street art is so popular, you’ve probably seen some of it – like the “You’re My Butter Half” mural or the “I Love You So Much Wall”. Like all great street art, there is usually a story behind the spray. The “I Love You So Much Wall” was apparently a message from the ex of the shop owner where the message is sprayed. An “I Hate You So Much” message also appeared in Austin later! Castle Hill is a great area in Austin for graffiti fans as artists have a canvas to play on. Even if you’ve been before it is worth a second visit as the work changes frequently. 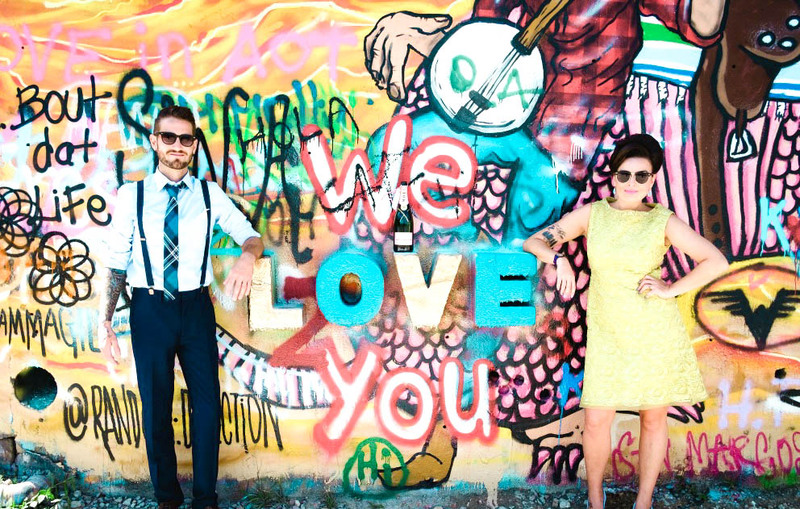 We love Austin so much we eloped there and got our wedding shots next to the street art. You can read more about our Austin tips here. The neighborhood of Wynwood, a few blocks north of downtown Miami, used to be a neglected area. Over the past decade, however, it has become a mecca for artists who have begun turning this previously decaying neighborhood into a vibrant and interesting community. One of the aspects that have made this a cool enclave is the street art you find throughout the neighborhood. 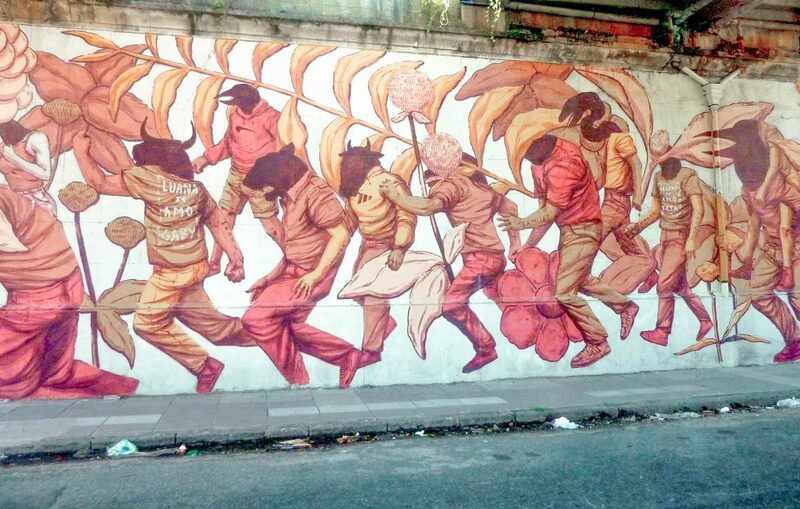 The streets’ walls are covered in spectacular art, both conventional and surreal. I highly recommend Buenos Aires as a city with great street art. Graffiti is all over the city. Some of the graffiti is artistic to my eye and some of it is not. I did a tour of Buenos Aires Street Art/Graffiti to find the best locations and to learn some of the history of street art in Argentina. Street art is particularly prevalent in the barrios of Colegiales, Chacarita, Villa Crespo and Palermo. Political parties have used graffiti for years but it wasn’t until the country threw off its dictatorship that graffiti was legalized for the people of Buenos Aires, therefore the art in the area often has a political message to it. It was middle class kids who could afford spray paint who started with graffiti. This mural under a highway overpass, for example, is a commentary on soccer thugs and their animal like behavior. Locals would recognize the different soccer teams’ fans pictured here while tourists might not even get the soccer reference without a good guide to explain it to them. Many of the works you will see are giant murals which in some cases span entire city blocks. There are also sanctioned projects repainting the underside of some highway overpasses. 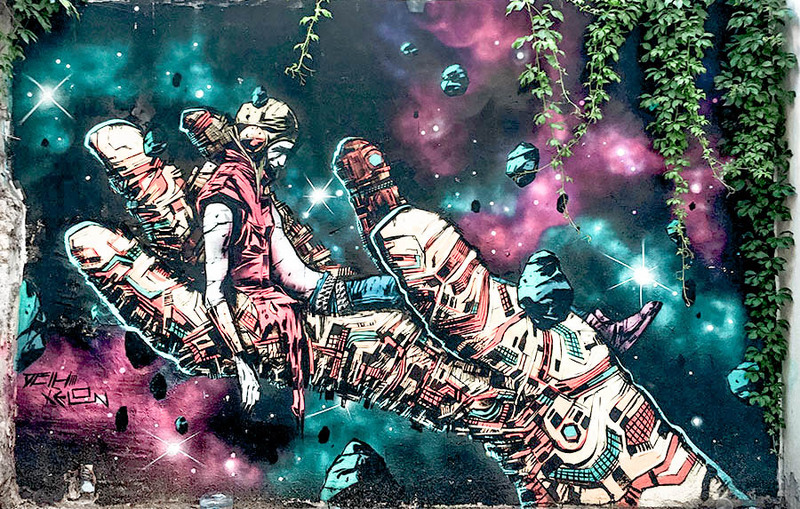 Belgrade may not be at the top of your list of best street art cities, but it should be! The capital of Serbia sports a thriving community of street artists. And the city’s mixture of architecture makes for the perfect canvas for their creations. Best of all, it’s possible to tour the streets of Belgrade with the street artists themselves! Street Up tours, launched just a year ago, connects artists with visitors for a unique way to experience the street art in the city. 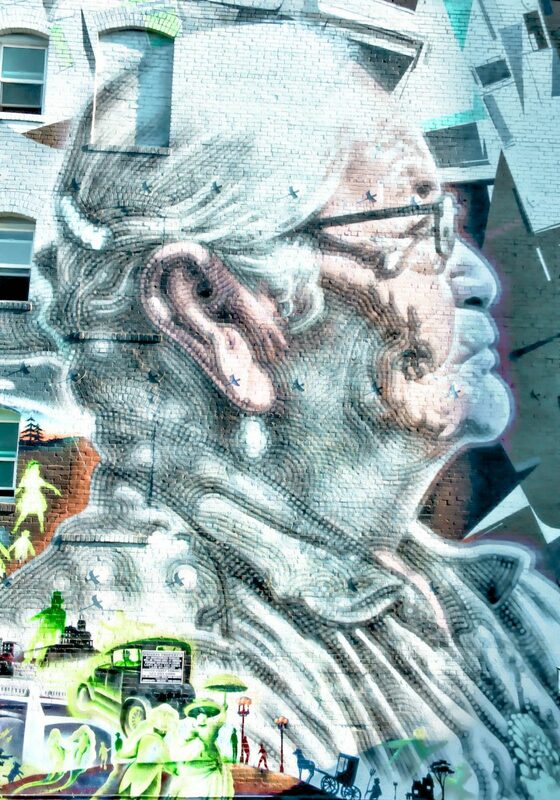 You’ll be led through the city by a local street artist, who will provide context on the murals and help you find hidden art that you didn’t even know was around the corner! Be sure to check out the vibrant Savamala district for incredible stencils and murals. Or wander the Dorcol neighborhood to check out the city’s bohemian quarter. Whether taking a tour or just exploring on your own, you’re sure to agree that Belgrade is one of Europe’s best street art cities! The beautiful waterside city of Lisbon, Portugal has become a mecca for artists and street art aficionados. Walking the narrow, cobblestoned streets you’ll see all varieties of art, such as portraits, scenes of landscapes or city life, small art installations, black and white pieces to those all colors of the rainbow, and more. 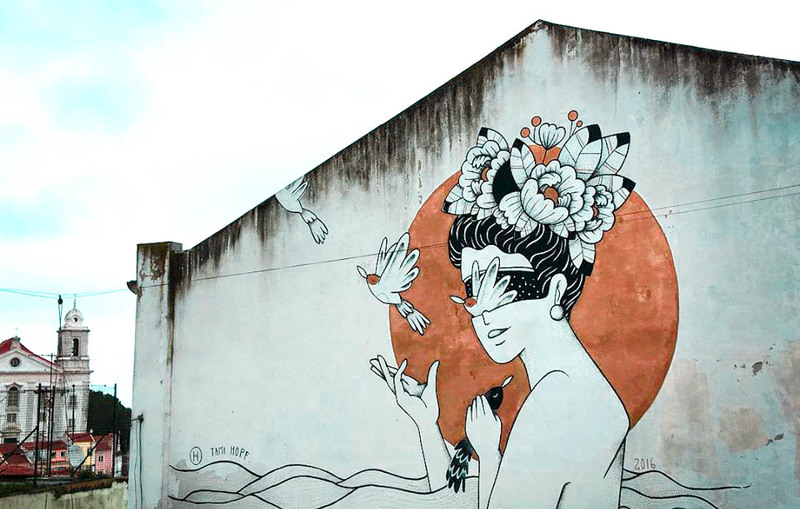 The neighborhoods on the central and eastern parts of the city have a high concentration of street art which goes on for many blocks, from Bairro Alto over to Alfama, São Vicente, and Graça, and a range of eclectic artwork and masterpieces can be found just roaming about. In the evenings, you’ll hear the soulful tunes of Fado music drifting down alleyways in the Alfama district, further immersing visitors in Lisbon’s feel and culture. Don’t miss getting a fresh custard pastel de nata at Pastelaria Alfama Doce or delicious food and wine at Chapito a Mesa while exploring Alfama’s old castle district. The funky and hip western side of the city, near the must-see LX Factory, also has a great street art scene as well as an array of artists displaying their works in studios and stalls. Lisbon Street Art Tours (www.lisbonstreetarttours.com) offers a variety of tours in English, French, and Portuguese to explore the city’s street art scene and learn more about its history. Nólsoy is a small, unique island in the Faroe Islands most well-known for its classification as an Important Bird Area by BirdLife International, especially for hosting one of the largest colonies of European Storm Petrel in the world. 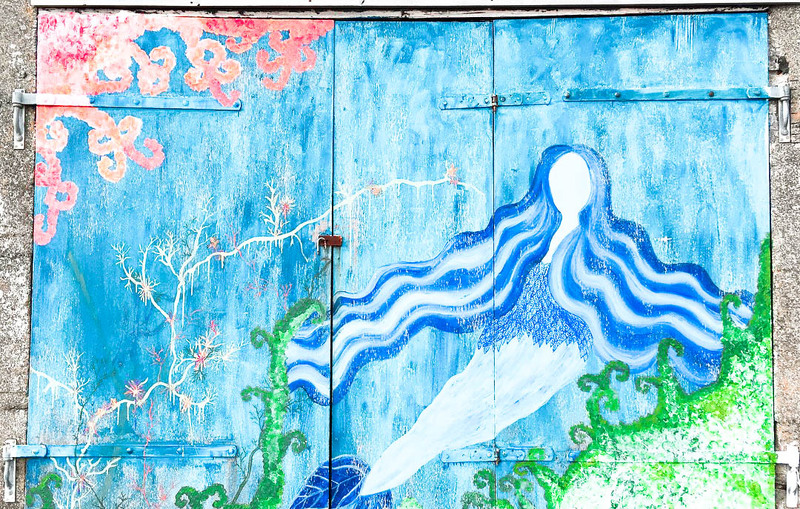 A little-known secret, however, on this small island is the art murals found on the old wooden doors of boat houses that line the docks leading out to the great Atlantic Ocean. Though there are only about 10 murals in total, they speak of the relationship that residents of Nólsoy and the Faroes have with nature and the sea, which is essential to their livelihoods and cultural identity. One story in particular tells of the Seal Woman, or Selkie, a legendary mythical creature that can shed her seal skin to walk amongst humans on land. The centuries long history of the Faroese people coupled with the magical scenery, including moss-hewn cliffs and grass-rooved houses set against the roiling sea, make these art pieces that much more special. Take the opportunity to hop on the last ferry of the day over to Nólsoy from the capital town of Torshavn, and explore these beautiful pieces of art before grabbing dinner and a room at the Kaffistovan í Nólsoy. In summertime, the Kaffistovan can also arrange for you to hike to the bird colonies at night with their experienced, local guide – you won’t want to miss seeing and hearing thousands of birds go in and out of their burrows in the midnight twilight! 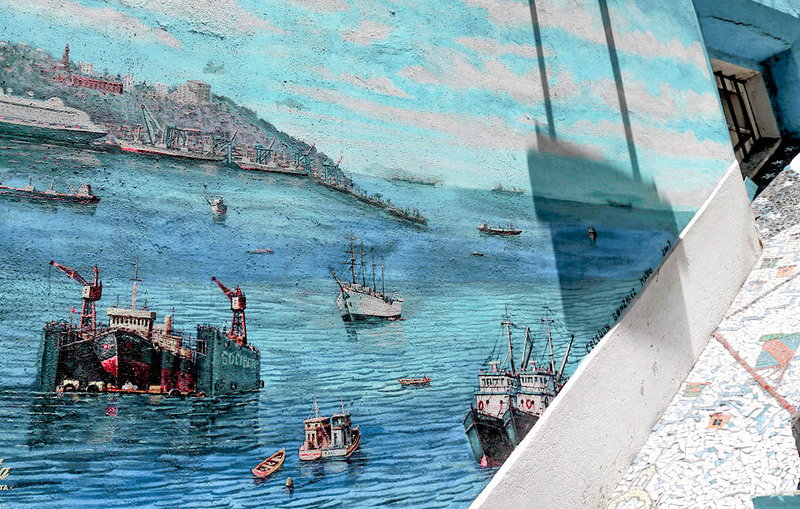 The beautiful coastal city of Valparaiso is considered to be an art capital of Chile. The city, squeezed between the sea and the mountains with its narrow streets on different levels, turn all of a sudden and end with a steep and long staircase heading somewhere into the skies. Not surprisingly street art here is something very special and perfectly fits its environment. There are three main barrios (neighborhoods) in Valparaiso to see street art: Cerro Concepcion, Cerro Bella Vista and La Sebastiana. The murals are impressive, even some famous Chilean and Latin American artists contributed to it. Some of the most interesting murals can be seen in the Open Air Museum (Museo a Cielo Abierto). The museum is located in the Bella Vista neighborhood and opened in 1992. It consists of more than 20 murals painted on the walls and houses. Some of the artists behind the wall paintings are Roberto Matta, Garcia Barrios, Mario Toral and Eduardo Perez. The museum has no entrance fee and can be visited any time. Of course, famous artists are not the only street art creators in Valparaiso – there are many works by students and unknown streets artists. Besides murals, another typical way of decorating the streets in Valparaiso is mosaic. Stairs and houses are covered in images and ornaments made from small pieces of colored glass and stones. The most impressive art stairs (Escaleras) are the Sunflower, the Piano, and Escalera Pasaje Galvez. You can spend hours walking around these neighborhoods and discovering street art murals, sculpture, and painted cars. If you’re looking for an interesting street art city, you shouldn’t overlook Copenhagen, Denmark. This trendy Danish capital is well-known for its Scandinavian design and adorable canals, but there’s so much more to Copenhagen than just that. A tour of the city’s street art is a highlight of any Copenhagen itinerary. The best place to find street art in Copenhagen is in the neighborhood of Freetown Christiania, a self-governing entity within Copenhagen’s city center. Christiania has a reputation for its lenient attitude towards soft drugs such as marijuana, but it really should be better known for its street art. 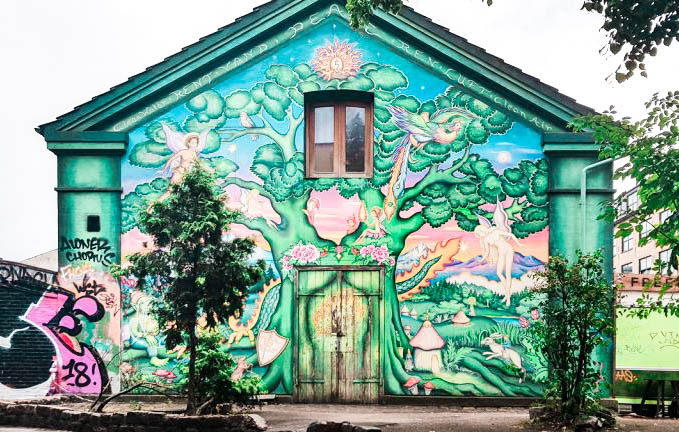 This neighborhood in the borough of Christianshavn is full of murals by local artists, including the famous “Christiania tree” at one of the main entrances to Christiania. 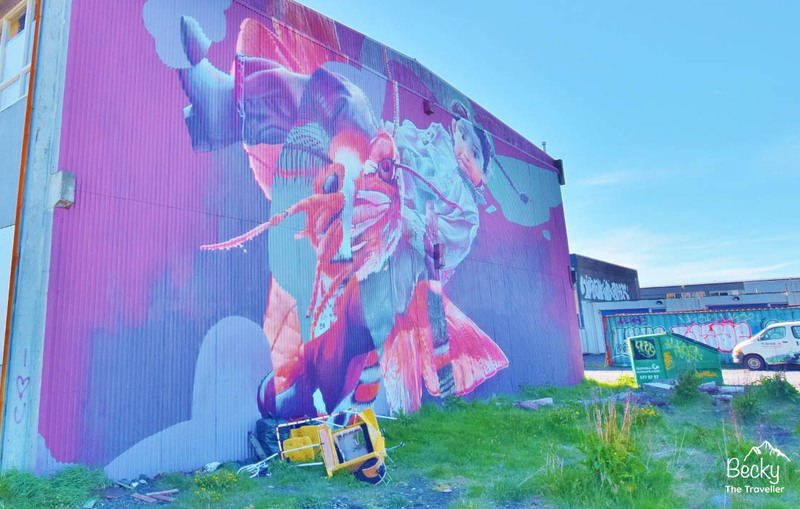 You can also find murals lining skate parks, abandoned buildings, and walls throughout this former industrial area that has been taken over by artists and anarchists. The art has a variety of artists and messages, but most are pacifist or humorous in nature. In addition to Christiania, you can also find street art in Nørrebro and Westend in Vesterbro, as well as along the street Rentemestervej which is home to eight massive murals. One of my favorite cities for street art is Toronto, Canada. Street art can tell a lot about a city. Toronto is one of the most multi-cultural cities in the world and Toronto’s street art beautifully reflects the culture, like Chinese dragons in Chinatown. One of the most popular spots to see Toronto’s street art is Graffiti Alley. It’s easy to find – it’s even on Google Maps! Graffiti Alley is a one kilometer laneway south of Queen Street West. While the street art here is ever changing, some pieces are staples – like one of my favorites, which is a huge building entirely covered in underwater scenes. Everything from fun fish to sharks, all in a wonderful orange glow. Another great spot for street art in Toronto is Underpass Park. You certainly won’t see as many people in this lesser known gem. It isn’t your traditional park with grass and trees but this urban park is a perfect city park. Home to basketball courts, a jungle gym, skateboard ramps, and some incredible and vibrant street art. 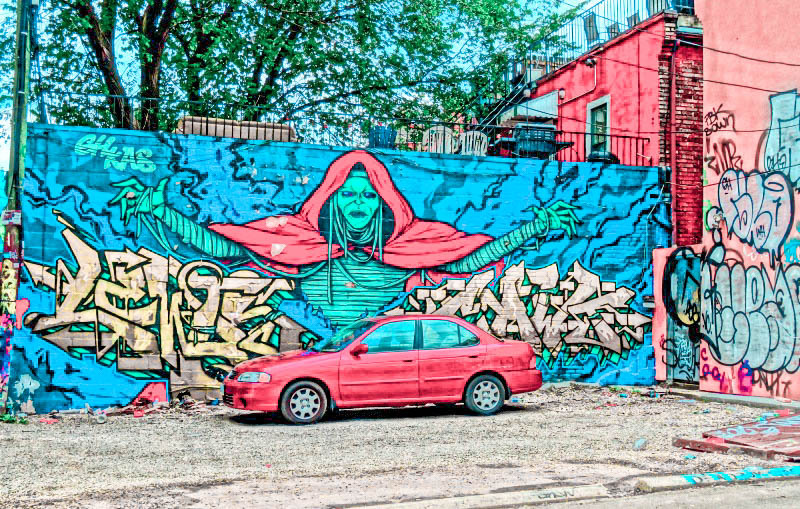 While there is an array of hotspots in Toronto to find street art, it can really be found everywhere across the city. From giant murals spanning towering buildings to alleyways full of colorful graffiti – Toronto is one of the top cities for street art. It’s not uncommon for outsiders to associate the city of Los Angeles with sunny beaches, blue skies, palm trees, movie stars, celebrities, and the like. Something that is less known, but no less inspiring, is the presence of amazing street art. All across the city are public art ranging from paintings and murals to unique sculptures. In at least one instance, even an old motel was white-washed to transform it into an expression of art. Another unconventional work of art is located at 5905 Wilshire Boulevard. Consisting of 202 closely spaced and solar-powered cast-iron street lamps, this spectacle powers on at night to create a breath-taking view. These attractions are due to the creativity and skills of many unknown and anonymous artists that take to the streets. However, there are a few who have made a name for themselves. One such artist is Shepard Fairey, whose best-known piece is a poster created during the 2008 Obama “Hope” Presidential Campaign. Another artist that is popular, but known only by his pseudonym, goes by “WRDSMTH”. His work is characterized by memorable and inspirational quotes featured with simple, but well-depicted artwork. 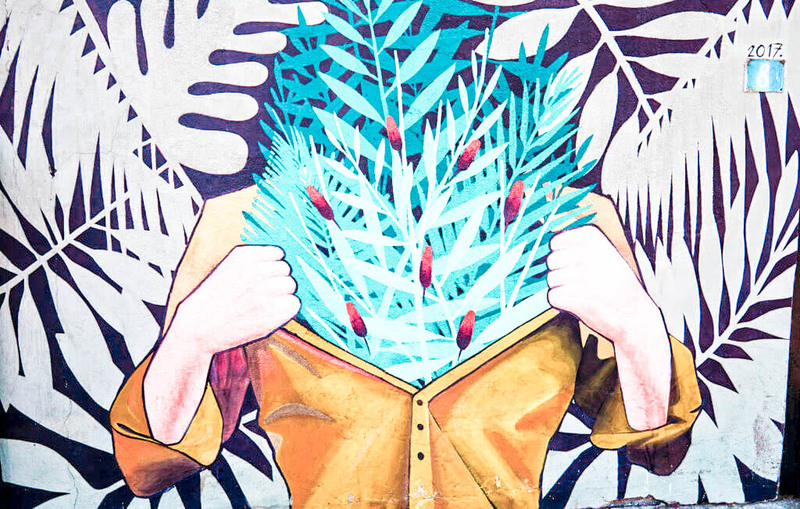 For art lovers or curious travelers alike, Los Angeles street art is a must-see. Valencia is in my opinion the most exciting city in Spain. Some even call it “the new Barcelona” but without the crowds. There’s been a lot of regeneration in the city, hipster areas and businesses are sprouting out everywhere and the art and cultural scene is booming. This also includes the increased popularity of street art in Valencia. Most of the art is located in certain neighborhoods, although it can be found everywhere in the city. Street art tours have become one of the most exciting things to do in Valencia. 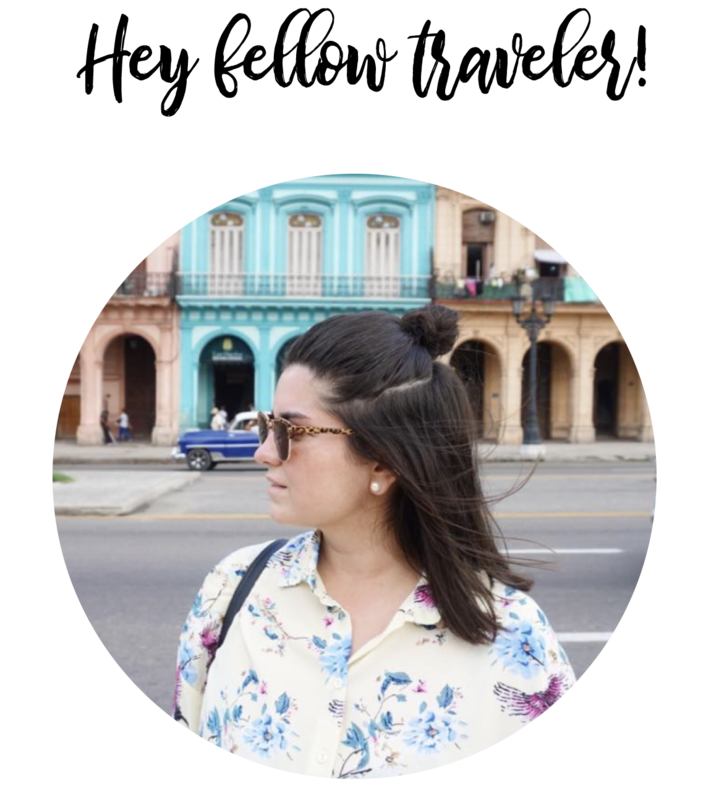 They take you through the neighborhoods of El Carmen and Cabanyal in particular, which have become a bit of a mecca for street art lovers. What I love about it is that there is a very active community of local street artists, and as you explore the pieces of art through the narrow streets, you will start recognizing their styles. You will find the ubiquitous and cheeky David de Limón popping up where you least expect it, and the creativity and talent of artists such as Deih, Escif, and La Nena Wapa Wapa is simply stunning. 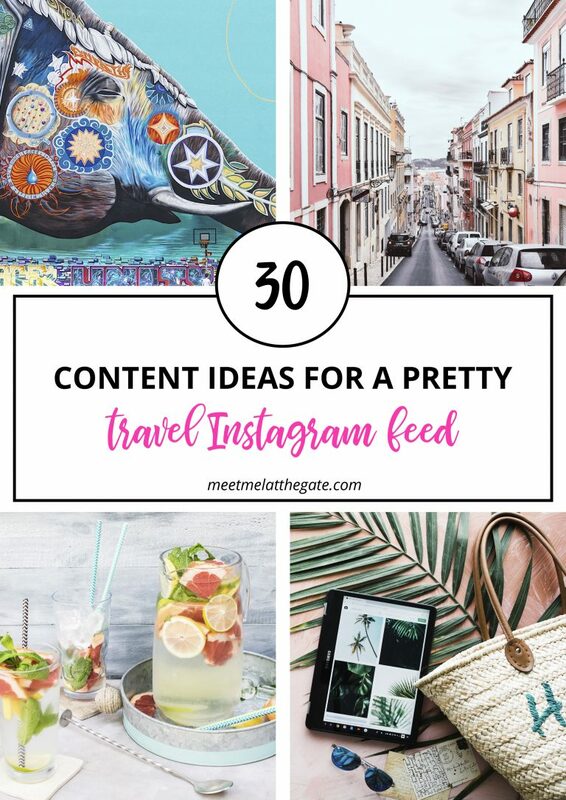 But it’s not just the local artists who are active in this community – you will also find great pieces by international artists such as Tona, Disneylexya, and Atila_the1. A feast for the eyes of street art lovers! George Town, Penang is my favorite city for street art. The art you’ll find here is a true celebration of the multi-cultural aspects of the city and gives a great insight into the city’s history. George Town has been a UNESCO World Heritage Site since 2007 along with Melaka and there’s no better way of exploring the heritage than by taking a walk around the street art installations. And there are lots here. Sculpture at Work has since 2009 installed 52 unique but humorous metalwork illustrations of the history of the city attached to its walls. Here you’ll find details of famous shoe designer Jimmy Choo and amusing digs at backpacker’s looking for cheap lodgings. 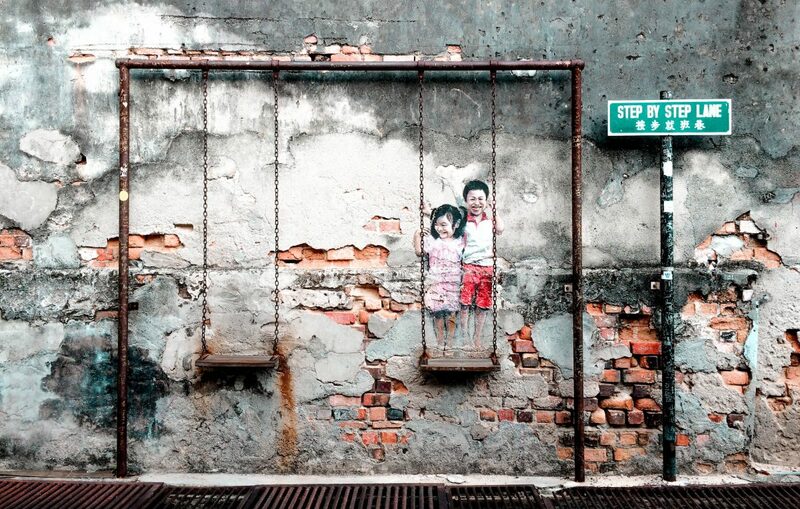 Ernest Zacharevic was commissioned to paint a few murals in 2012 – and other artists have since contributed. These pieces of art combine paint and materials to create an interactive approach that is extremely popular and good fun to see. The installations are spread throughout George Town and the city provides a map and a walking route to see the major installations. It’s a great way to see the city and explore the streets, and the artwork is both stunning and humorous. Ipoh, the capital of Malaysia’s Perak state, is located about three hours by train from Kuala Lumpur. The city has long been lauded as a top destination for foodies — but what many people don’t realize is that Ipoh has an excellent street art scene, too. Like nearby Georgetown, Ipoh is characterized by its heritage architecture, laneways and gentrified cafe districts — the perfect canvas for murals. 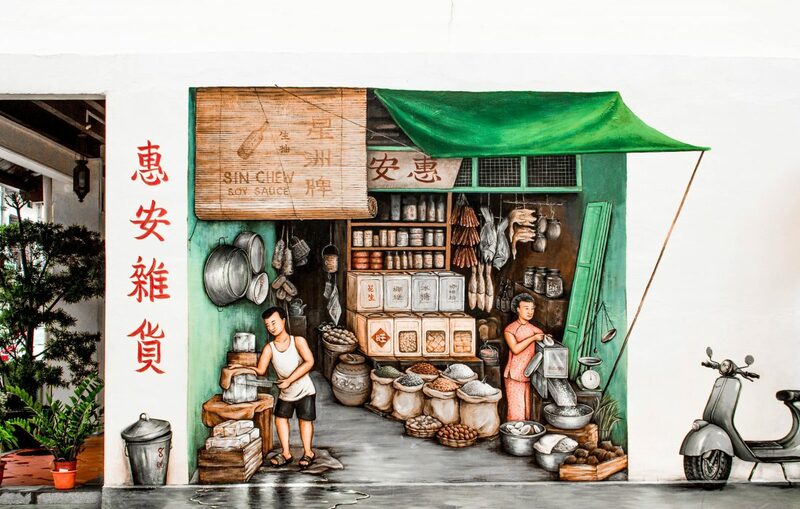 A few years ago, local business Old Town Coffee brought Lithuanian artist Ernest Zacharevic (the same artist behind some of Penang’s most famous murals) to Ipoh to create eight large-scale paintings in the Old Town area. Zacharevic’s imagery is inspired by local heritage, and depicts white coffee (for which Ipoh is famous), the city’s mining heritage, and other themes. They can be visited as part of the “Ipoh Mural Art Trail”. There are lots of other murals dotted around the Old Town, hidden behind shop houses and down alleyways. But my favorite Ipoh street art is located over the river in the new part of town. Mural Arts Lane is a network of narrow lanes covered from footpath to rooftop with dozens and dozens of artworks. Most are by local artists (including Eric Lai, an art teacher), and many have been created in partnership with community groups and schools. Ipoh is still relatively off the tourist radar, meaning you certainly won’t have to queue to photograph the street art like you so often have to in Penang. 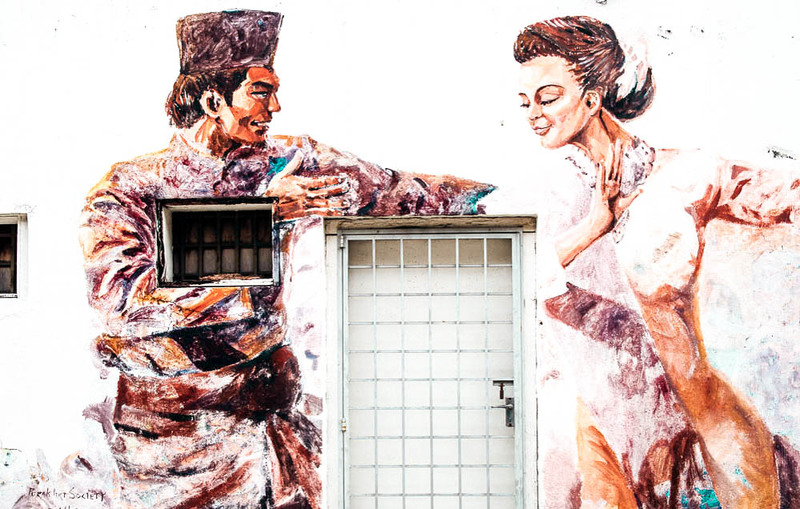 Paired with an amazing food scene, off-beat architecture and its close proximity to Cameron Highlands, Ipoh’s street art makes it a must-visit destination in Malaysia. I am not a huge fan of cities, but when it comes to Singapore, it’s difficult not to fall in love with it. And given that the city is such a majestic one, the best activity is to walk around and discover its neighborhoods. You will be pleasantly surprised to find some pretty impressive street art as well. 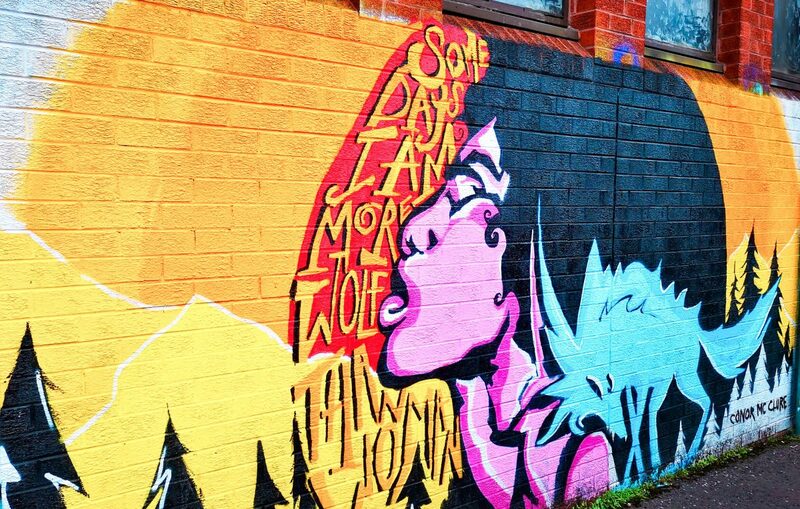 One of the places where you will encounter some very vivid street art is Everton Road. The street is filled with murals painted with everyday scenes but in such a manner that one could easily assume that they are for real. 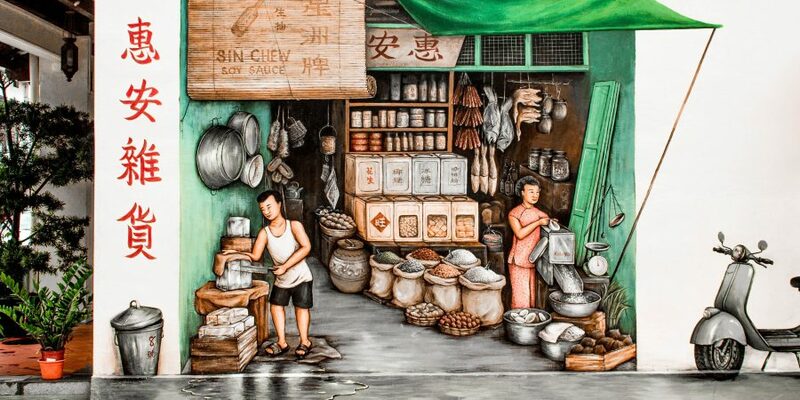 The paintings found on Everton Road in Singapore are the art of Mr. Yip Yew Chong. His murals are now depicted in dozens of magazines and travel blogs that recommend them for your next trip to Singapore. It’s interesting, if you have enough time, to just walk around in the area and absorb the details in the paintings. The longer you look at them, the more surprised you’ll be. That’s because the artist made sure to include many tiny aspects that contribute to the real feeling of the images. To get to Everton Road, the easiest way is to either walk there through Chinatown or to take the East West Metro Line up to Outram Park MRT Station and walk 10 minutes from there. My favorite street art city has to be Berlin, the capital of Germany. It has long been known for its iconic street art, even before it was called “street art”. I vividly remember the “graffiti” on the Berlin Wall before it was torn down in the late 1980s, and the tradition continues to this day. One of the best-known places to see street art in Berlin is the famous East Side Gallery, a preserved section of the wall with an array of fantastic murals. These include the Brezhnev-Honecker kiss, the Trabant car bursting through the wall, and many others pieces. 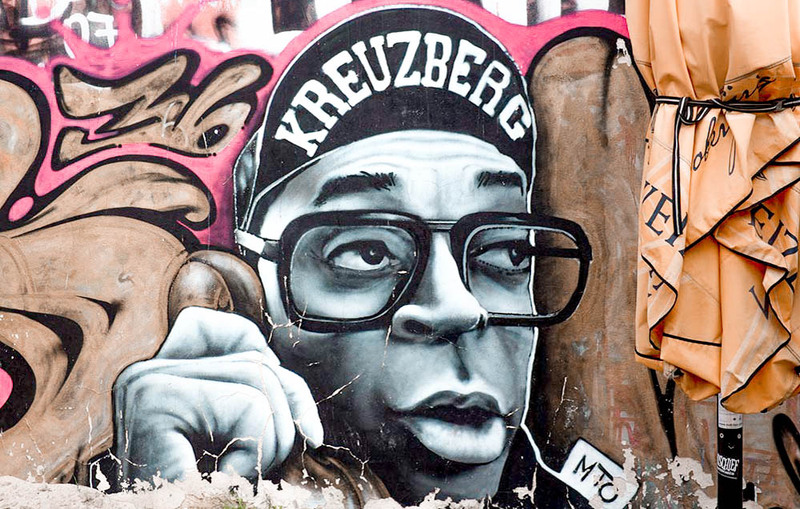 We found great street art all over the city, and one of the best areas for it is Kreuzberg. Here you can see the Cosmonaut mural on Mariannenstrasse, and the incredible Pink Man, close to the Oberbaumbrücke. Görlitzer Park also has some great murals, including the hip-hop one pictured. After over 40 years of communist ruling under a very oppressive and isolating ruler, Albania came out with more willpower than ever to turn things around, especially in the capital of Tirana. 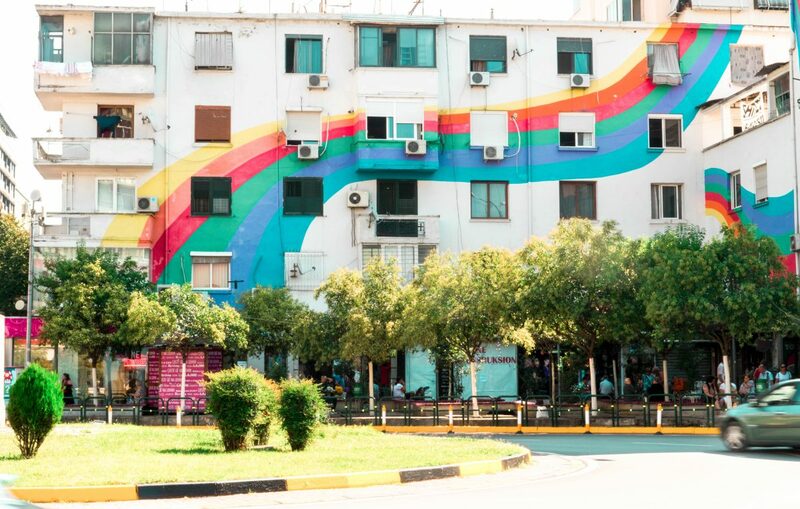 The mayor, faced with a limited budget and a very grey architecture and urban outlook, decided to put his artistic career into good use and repaint the facades of the many buildings in bright colors and murals. The result is one of the most colorful capitals in Europe, with many streets entirely painted in orange, yellow or green and locals taking over with nice murals, street art installations and lots of impromptu initiatives. To look for street art, simply walk around. You will without a doubt see the electricity boxes painted with cartoon characters and find many facades of former communist concrete buildings now with a new life. Head over to Uilson Square for the famous rainbow buildings. Belfast in Northern Ireland has an incredible street art scene, which is a far cry from the political murals that the city used to be known for. Although street art is found all over the city, the Cathedral Quarter is definitely the place to go to see lots of street art in a relatively small area. 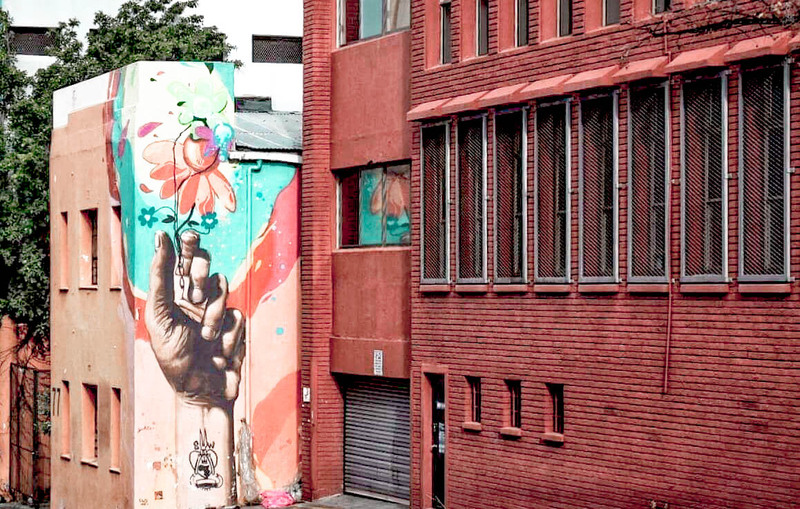 Every year, the city hosts a street art festival when street artists from all over the world come to Belfast to paint and stencil the walls, turning what used to be a drab, industrial city into a colourful, vibrant destination. I love the street art in Belfast because it is so plentiful and so colourful. There is something for everyone, whether you prefer bright patterns, beautiful portraits or statement pieces you are bound to find something you like. My personal favourites are the most colourful murals, it really helps to brighten my day! If you’d like to find the street art in Belfast, walking around the streets in the Cathedral Quarter you should be able to find plenty of murals, but don’t miss North Street between Royal Avenue and Union Street, or Winetavern Street Car Park across the road. The Sunflower Pub has murals all around it, and you’ll also find some more on Hill Street and Talbot Street, as well as the corner of Academy Street and Exchange Street. Can’t get enough of street art? 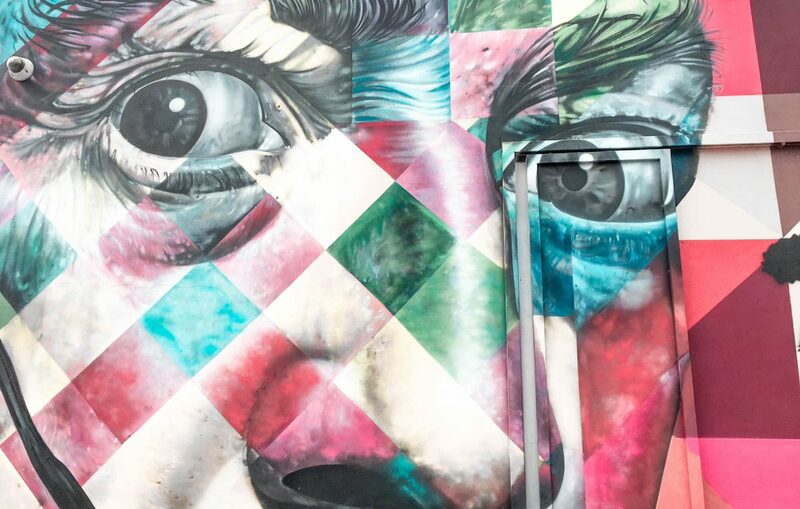 Head to Dubai where street art is blooming. Check out the ultimate travel guide to Dubai before you go. SO many places to add to my street art bucket list! Thanks so much for letting me share one of my favourite places for street art! Thank you for sharing Stephanie! I need to visit Toronto soon! Thank you for being a part of it Christa!